Mix the sugar, the eggs and the vanilla extract in an electric mixer for about 5 minutes. Melt 2/3 of the chocolate with the butter ( in a microwave oven). Add the melted chocolate to the mixture in your electric mixer and let it do its job for 3 more minutes. 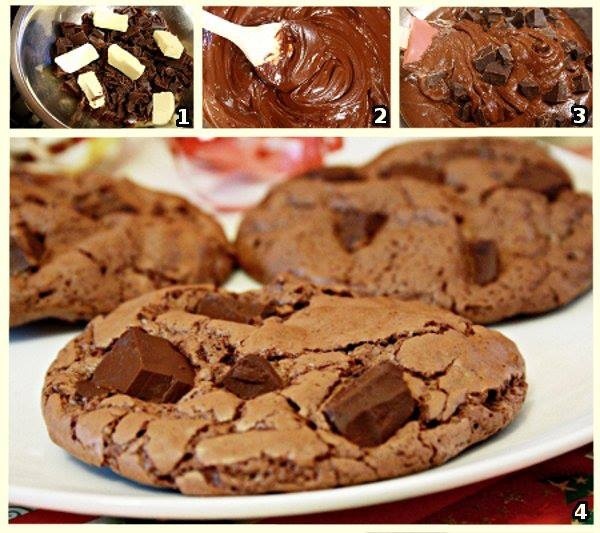 In a medium bowl, whisk together the flour, baking powder and salt and add it to the chocolate mixture in the mixer. Stir. Gently stir in the rest of the chocolate chunks. Drop heaping tablespoons of the dough 2 fingers apart onto a baking sheet.